Tyrants make themselves out to be fearless and all-powerful. But they are really cowards. When I was a young boy, I was always taught "scratch a bully, find a coward". And here we have not one but two cowards at the head of the current administration. One of which - when it was his turn to offer his military service to his country - ran and hid in the Texas Air National Guard (complete military records NOT available upon asking!) and another who got at least FIVE deferments so he wouldn't have to bring his sorry behind to Vietnam. Scratch a tyrant, find a coward. On the other hand, real men stand up to tyrants. Therefore, it is certain that Israel's massacre in Gaza is not related to any specific recent rocket attacks by Hamas. So why did Israel choose this moment to attack Gaza? Well, the Bush administration will be out in mere weeks. And while Obama has made nice with AIPAC and Israeli interests, Israel isn't sure that he will be as acommodating as the current administration. The Israeli decision to launch the attacks on Gaza was a political, not security, decision. Just a day or two before the airstrikes, it was Israel that rejected Hamas’s diplomatic initiative aimed at extending the six-month-long ceasefire that had frayed but largely stayed together since June, and that expired 26 December. Hamas officials, working through Egyptian mediators, had urged Israel to lift the siege of Gaza as the basis for continuing an extended ceasefire. Israel, including Foreign Minister Tsipi Livni, of the “centrist” (in the Israeli context) Kadima Party, rejected the proposal. Livni, who went to Egypt but refused to seriously consider the Hamas offer, is running in a tight race for prime minister; her top opponent is the further-right Benyamin Netanyahu of the officially hawkish Likud party, who has campaigned against Livni and the Kadima government for their alleged “soft” approach to the Palestinians. With elections looming in February, no candidate can afford to appear anything but super-militaristic. I think the big trade in 2009 will be to go short Treasurys massively -- I really mean massively -- because we may not have inflation for one, two, three years . . . .
Jim Rogers is saying the same thing. Rogers agrees that long-term treasuries are the last bubble, and is going to short them at the appropriate time. 60 years after Hitler, the exact thing which we most remember are his concentration camps. Do we remember the false threats he drummed up to scare his people? The fake threat from Poland, for example, which is the exact parallel to the Neocon's fake "war on terror"? Well, people either understand that Hitler used false flag terror in the same way that the Neocons, or else they don't know anything about Gleiwitz Incident, the Reichstag fire and other precipitating incidents which Hitler used to drum up fear of an imaginary enemy. One thing is for certain. In 100 years, 9/11 will be seen as an American Gleiwitz Incident, and the Neocons will be recognized as the tyrants they are. Lots of problems, to be sure, as all emerging markets do, but India will come back. Japan is the least sick rich economy. Neither November's export slide, nor Toyota's profit woes, are what they seem. Corrected for yen appreciation, exports were down 8.9%, imports up 6.9%. Japan's recession is mild and its fiscal stimulus modest. The yen's strength is a sign currency markets see underlying health. In an article entitled How India Avoided a Crisis, the New York Times reports that while India has been severely affected by the economic crisis, it was not nearly as exposed as the U.S. Specifically, the Times reports that Indian regulators largely kept India's banks away from derivatives, securitizations, and other risky investments. Indian companies should prepare for economic growth of 7 percent in the year ending March 31, down from 9 percent or more the previous three years, the government said Dec. 23. That pace is still the second-fastest among the major economies -- behind only China. So buying some Indian stocks might be smart, as long as you can buy and hold for the long-term (until the worst of the depression is over). Would They Be Planning to Use Troops Against Americans If They WEREN'T Stealing Our Money? My guess . . . both. How Come Israelis Can Criticize Israel, But Americans Can't? Whether or not you agree with these opinions, the point is that they can be expressed in Israel. In America, people are lambasted for even raising the issue of whether Israel could possibly do anything wrong. Scathing criticism of Israel's behavior can -- and does -- appear in one of Israel's leading newspapers, but not a paragraph of it could ever be uttered by any American politician, in either party, of any national prominence. American politicians are pro-Israel because that's what the public wants. Right? One can travel from the farthest right fringe of the GOP to the heart of the Democratic Party leadership and hear exactly the same thing: Israel is always right. Israel must not be criticized. Israel never bears any blame. Any action taken by Israel is justified. No matter the situation, that just gets repeated over and over like some hypnotic bipartisan mantra. Meanwhile, American citizens overwhelmingly ... want their Government to be "even-handed" in the Israeli-Palestinian conflict. Yet that view is simply ignored, disregarded, not even viable for any American mainstream political leader to express. As with the Iraq war, the bailout, torture, and everything else, the powers-that-be in the U.S. government ignore what Americans want and do whatever they like. "Islamic banking is saying we are close to our clients and we're only going to do genuine transactions where we can see the asset, we understand the asset, we can make an assessment of that asset: whether it's financing a ship or an aircraft they will go and have a look at the business. It's giving guidance as to what banking should be." So is the Islamic financial system superior to Western banking? Western bankers have made themselves demigods with a combination of usury and legalized state-sanctioned counterfeiting. They attack anyone who represents any threat ot their enslavement of others, whether it is the Islamic system of lending or the re-introduction of fixed worth monetary systems. 25 " If you lend money to any of My people who are poor among you, you shall not be like a moneylender to him; you shall not charge him interest. 19 " You shall not charge interest to your brother -- interest on money or food or anything that is lent out at interest. So the question is whether there is any wisdom in the traditional religous prohibition against usury. I think the answer is yes. And Islamic bankers apparently follow that prohibition much more faithfully than Western bankers. Note: I despise fundamentalist Muslims as much as fundamentalists of any religion. So I'm not talking about fundamentalists, but moderate Muslim bankers. And rather than being an issue of superiority of the Muslim faith, I merely see this as the Judeo-Christian traditions losing their way, and religious leaders distorting the truth. Banking isn't the only area in which Western nations have lost their ethical foundation. Torturing innocent people and launching wars based on lies are also contrary to the teachings of the Bible. Whether you are Christian, Jewish, Muslim, Hindu, Buddhist, atheist, spiritual or anything else . . .
Al-Qaida, literally "the database", was originally the computer file of the thousands of mujahideen who were recruited and trained with help from the CIA to defeat the Russians. Former National Security Adviser Zbigniew Brzezinski told the Senate that the war on terror is "a mythical historical narrative". And see this Los Angeles Times Article, reviewing a BBC documentary entitled "The Power of Nightmares", which shows that the threat from Al Qaeda has been vastly overblown (and see this article on the people within the U.S. who are behind the hype). Not only has the U.S. government hyped Al Qaeda, but it has issued numerous fake terror alerts to scare people. There is a word for intentionally creating fear in order to manipulate opinion for political ends: terrorism. The truth is, there is no Islamic army or terrorist group called Al Qaida. And any informed intelligence officer knows this. But there is a propaganda campaign to make the public believe in the presence of an identified entity representing the 'devil' only in order to drive the TV watcher to accept a unified international leadership for a war against terrorism. The country behind this propaganda is the US." However, I did a little digging, and discovered that the quote was misattributed to Cook. It was actually made by former French intelligence and military officer Pierre-Henri Bunel in this speech. Until This Year, the International Energy Agency Mocked People Saying Oil Supplies Might Peak. Now, the IEA Says Supplies Will Peak "Around 2020"
Until this year, the International Energy Agency mocked people who said that oil supplies might peak in the near future. Now, the IEA has changed its outlook and predicting that oil supplies will peak "around 2020". Peak oil would have huge effects on economics and politics. Note: I have been agnostic about peak oil. While the largest oil fields appear to be declining, there have been new massive new oil fields discovered. And my father-in-law tells me that people predicted peak oil decades ago, but were proven wrong. It is also possible that there are unseen political forces pressuring the IEA. The IEA does not include any Arab countries, and is dominated by Western countries. It is possible that there are behind-the-scenes geopolitical pressures arguing for a declaration of peak oil. However, the shift in the IEA's position is so dramatic that I have to take it seriously, and am now tenatively convinced in the reality of peak oil within the next couple of decades. Congressman: "If We’re Not Very Lucky Or If We Don’t Do Everything Right, We Could Easily Have A Ten- Or Fifteen-Year Depression"
The economy is on the brink of an absolute catastrophe. I’ve been saying for six or seven months now that we’re in 1931. In 1931, a recession that started with the Crash of 1929 tipped into a fifteen-year depression. We are on the precipice of that. If we are very lucky and if we do everything very right from now, we will probably have a two- or three-year very bad recession. If we’re not very lucky or if we don’t do everything right, we could easily have a ten- or fifteen-year depression, a repeat of the 1930s. While many other people have warned of a depression, including the IMF, the National Bureau of Economic Research, Spain's central bank, and some of the economists who predicted the financial crisis, the length of a depression discussed by Nadler is stunning. The government is obviously not doing "everything right", so Nadler's warning doesn't really contain much wiggle room. Gold and oil prices historically move in tandem. Crude-oil futures fell Monday to below $40 a barrel as demand concerns outweighed news that the Organization of Petroleum Exporting Countries could cut production further. On the other hand, MarketWatch said "Buying of the metal as a safe haven against the ailing economy returned." One day obviously does not make a trend. But it will be interesting to watch whether today was the beginning of an unwind of the traditional link between gold and oil prices. If so, it will be because worldwide deflationary pressures (at least before runaway inflation kicks in) and a reduction in demand are leading to lower oil prices, while a rush to safe haven investments is pushing gold higher. One trend for oil, a different one for gold? Peter Schiff called the financial crisis years ago. And Schiff has argued for years that - after an initially bumpy ride - Asia and Europe will decouple from the sick U.S. economy, and recover much more quickly than the U.S. Therefore, Schiff has advocated buying dividend-paying shares in European and Asian countries (and he's convinced enough people of his decoupling theory that he now manages over a billion dollars in investments). Up until now, it seems that Schiff has been totally wrong about decoupling. Asia and Europe have been tanking right along with the U.S. The crisis will affect in different ways the different regions of the world. However, and LEAP/E2020 wishes to be very clear on that aspect, contrary to the dominant stance today (coming from those experts who denied the fact that a crisis was coming up three years ago, who denied that it was global two years ago, and who denied the fact that it was systemic six months ago), we anticipate that the minimum duration of the decanting phase of the crisis is 3 years (1). It shall be finished neither in spring 2009, nor in summer 2009, nor at the beginning of 2010. It is only towards the end of 2010 that the situation will start stabilizing again and improving a little in some regions of the world, i.e. Asia and the Eurozone, as well as in countries producing energy, mineral and food commodities (2). Elsewhere, it will continue; in particular in the US and UK, and in all the countries depending on their economy, were the duration could approximate a decade. In fact these countries should not expect any real return to growth before 2018. It is still too early to know whether Leap (and Schiff) are right. But there are interesting indications that Japan and India are faring better than the U.S. so far. With the exception of Japan, which recently emerged from its own "Lost Decade," Euler expects that almost every country in the world will see a rise in insolvencies far greater than previous economic downturns. Of course, Western Europeans countries were all heavily exposed to derivatives. In addition, they loaned far more than the U.S. to emerging market countries. So it is possible that Japan and India might come out of the crisis earlier than the U.S., but Europe might not. Do Elliot Wave and Other Predictive Stock Indicators Work? A wise older man is consulted regarding a problem the client is having: he is in danger of losing his job and his wife, and he doesn't know why. The older man pours a cup of strong turkish-style coffee while he chats with his client. While sipping the coffee, he notices that the client has bags under his eyes, but that his eyes are bugged out somewhat. He also notices that the client appears nervous and fidgety, his hands dart manically through the air, and he keeps shifting his legs. Also, he notices that the client frequently rubs his nose, and that a hint of white powder on the client's shirt cuff, which is smeared as though the client tried to wipe it off but didn't do a thorough job. The older man makes a big show of pouring the dregs from the coffee cup (turkish coffee has coffee grounds in the bottom of the cup) onto the table, moving them around with a finger, and squinting at them. He then says - peering into the coffee grounds the whole time - "I see that you have a drug problem. The coffee grounds say that you . . . let me look closer at the grounds . . . are spending all of your money on cocaine, and that your job and family problems stem from your impulsive behavior. The grounds say that - unless you stop using cocaine - you will suffer worse problems." The moral of the story is that the old man was observant, and he could tell from clues in his client's behavior that the client was using cocaine. He was merely using the coffee grounds as a "prop" to tell his client what he needed to hear. Similarly, if a market analyst is wise, he could spot trends using his own skills, but ascribe it to technical indicators like coffee grounds. Due to substantial trading experience or a a particular type of genius, some people are good at spotting trends. Is There Any Merit To Elliot Wave Theory? PhD economist Marc Faber and investment advisor Mike "Mish" Shedlock are both guys who have been right about a lot of things. Faber predicted the '87 crash and the current economic crisis. A quick search of Mish's past articles (type in any economic phrase you like) shows that he has been consistently a lot more accurate than not in predicting how things would shake out. Both Faber and Mish - as well as many other leading market analysts - use Elliot Wave theory. On the other hand, critics say that Elliot Wave theory can't be true, because the interpretation of when waves start and when they end is so subjective. Ask 10 Elliot Waver theorists when a wave started, and you'll get 10 different answers. For example, Elliot apparently believed that "Grand Supercycle IV" started with the founding of the United States, while Robert McHugh believes it started before then, in 1718. Critics also say that Elliot Wave theorists "spot the trend" in hindsight, adjusting their Elliot Wave count so as to conform to the trend after it is established. Moreover, since Elliot Waves are based on fractal patterns, it is possible to spot waves on different scales, and so it is hard to know what level one is looking at. But what do scientific studies show? (4) when people spend a lot of time learning what does and doesn't work in wave theory. Statistical analysis also shows that many Elliot Wave theorists' calls on when waves started and ended is wrong. And see this. In other words, Elliot Wave theory can provide useful information, but you have to really know what you're doing, and it is not useful except in certain circumstances. There are numerous other cyclical prediction systems, including for example the Kondratieff Cycle (which Faber and Mish both also follow), and many others based on psychology, sociology or other factors. Of course, some indicators - for example those looking at volume and volatility - are more grounded in reality than others. Because many of these predictive systems may have some real ability to track trends, perhaps they are more useful than staring at coffee grounds. A more accurate analogy may be weather patterns. A long time ago, before the discovery of high and low pressure systems, chaos physics and other factors which contribute to our understanding of weather, people whose job it was to forecast weather (say those planning shipping dates) would try to make sense of complex weather patterns and make predictions about the future. With the very incomplete tools they had, some people were better at spotting patterns than others, and so made better predictions. Unlike coffee grounds, looking at complex weather patterns actually does have something to do with predicting future weather. Some people are better at getting a coherent picture and trend out of the chaotic picture than others. The same is true with the stock market and other markets. Some people are more skilled at picking patterns out of noise. But again, they might ascribe to technical indicators what they are really picking up using their own mental and intuitive pattern-spotting abilities. And just like meteorologists get better at predicting the weather as they understand the science behind what causes different weather, market predictors might get better as they refine their knowledge of the psychology of markets. Market predictions using technical indicators which takes macroeconomic and political realities into account should be more accurate than ones which uses the indicators alone. I have my doubts whether some of [Prechter's] price targets will be fulfilled. I rather believe that in the next recession, governments will immediately reflate massively, which will quickly lead to rising inflation rates and, eventually, hyperinflation. As a result, I doubt that the Dow Jones could fall much below 1000 -the level from which the bull market started in the early 1980s -and, according to Mr Prechter, a strong support level. Robert Prechter ignored and/or did not foresee many things that could keep the credit bubble expanding. Let's start with a flashback to conditions of the 70's and 80's. Like a meteorologist who checks technical readings but doesn't actually look out the window (and satellite photos), people who use only technical indicators and not also macroeconomic information are trying to navigate with one eye closed. Marc Faber said that - in this crazy market - you have to be a genius to make money. Faber himself may be a genius, so that is quite a statement. In addition, with all of the bailouts and other government intervention recently, we are not really still in a "free market". Trillions of dollars of government intervention is presumably unprecedented in history - even including communist and fascist systems. Whether Elliot Wave analysis aand other technical indicators will continue to work in this environment remains to be seen. In Keynes And Friedman Were Both Wrong, I argued the two most widely-followed economists both misdiagnosed the fundamental problem which led to the Great Depression and both prescribed the wrong medicine for getting out of such a slump. This essay will show that, in addition to being wrong on the economics, they were both cheerleaders for tyranny. Naomi Klein documents in the Shock Doctrine that Milton Friedman advocated a kind of "disaster capitalism". Specifically, whenever a natural, economic, war-related, or other disaster strikes, the Friedmanites pounce and use the opportunity to quickly impose a brand of economic policy which benefits the elite at the cost of everyone else (by increasing unemployment, pushing the cost of essential goods through the roof, and otherwise increasing poverty), while people are still in shock and before they can react. Keynes himself viewed the Nazi efforts with favor. In his preface to the German edition of The General Theory, dated September 7, 1936, Keynes indicated that the ideas of his book could more readily be carried out under an authoritarian regime: "Nevertheless the theory of output as a whole, which is what the following book purports to provide, is more easily adapted to the conditions of a totalitarian state, than is the theory of the production and distribution of a given output under conditions of free competition and a large measure of laissez-faire." Whether or not Keynes himself actually liked authoritarianism, he did not speak out against it. Rather, he helpfully told fascists that his system would do wonders for them. The two most influential economists of the 20th century were both servants to those in power, be they neoliberal "disaster capitalists" or potential practitioners of Keynesian economics who just "happened to be" totalitarians. Put another way, economists who called for programs which benefited the majority of citizens and a government which respects individual liberties have been sidelined and marginalized, and ignored by government and academia. It is time for a new economics. One which benefits the people and understands the centrality of their freedoms. The White House is on a blitz to try to persuade Americans that 9/11 wasn't foreseeable. In an interview broadcast today, Secretary of State Rice said Bush didn't ignore any 9/11 "warning", because there was no "'when, where, how". Other than that, it is totally believable. Liberals credit John Maynard Keynes with ending the Great Depression with his stimulus programs. Conservatives and "modern" economists credit Milton Friedman with figuring out the real cause of the Depression - too small a monetary base - and creating modern monetary policy. But a team of UCLA economists have determined that some of FDR's policies actually prolonged the depression by 7 years. And some very smart economists credit the manufacture of armaments in World War II (especially those sold to England before America even entered the war) as the thing which really got us out of the Depression. Indeed, as discussed below, proponents of the Austrian school of economics have been saying for decades that you can't stimulate your way out of a Depression with government programs. And guess what — it doesn’t seem to be workiing. I think [Friedman's] thesis ... has just taken a hit. (Even the co-author of Friedman's treatise on the Great Depression says that Bernanke is doing the wrong things to solve the financial crisis). So if neither Keynes nor Friedman was right, who was? The Austrian economists and others who said that depressions are caused by speculative bubbles and too-easy credit, and that the only way to get through them is to let businesses which made stupid decisions fail. It is painful in the short-run, in the same way that surgery to remove a small tumor is not fun but is life-saving. But we get through the slump years earlier than if the government fiddles with the economy, which almost always makes it worse. As prominent economist Marc Faber says, the "best medicine" is to let some companies fail and to let the crisis "burn itself out" (he also says that Bernanke and Paulson's actions will prolong the economic crisis by years). Liberals and conservatives have to let go of their pet theories and do what will actually work to shorten the time of this financial crisis - let the gamblers fail, let the markets clear out the debris from the con artists and greedheads and snake oil derivatives salesmen . . . and after a brief rough patch, the economy can right itself. Part of the reason that Keynes and Friedman were both wrong is that the Fed was created in 1913 - years before either of them came up with their theories. The Fed has distorted the economy and the free market. We need to abolish the Fed and let the markets work. If you started reading this because you thought there might be a reason to suspend a law, you're in danger of falling prey to propaganda. My purpose in writing this is to inoculate you against this type of propaganda. Pundits, talking heads and government officials will try to subtly convince Americans that a "temporary" suspension of "minor" and "outdated" laws is necessary to stabilize the economy. But remember, all tyrants claim that the suspension of liberties is a "temporary" measure, "just until the crisis passes". It never is. Once repealed, the repeal remains in place permanently. And the so-called "minor" and "outdated" laws will really be the freedoms guaranteed in the Bill of Rights. You know, those little things which our forefathers fought and died for. Preserving our liberties is the most important thing. The morons who got us into this financial crisis may or may not be able to fix it, but shredding the Constitution is not a prerequisite to their taking effective action. In fact, if our leaders started complying with the rule of law, that would dramatically improve the chances of an economic recovery. Sea ice has been shrinking in the Arctic, at the "North Pole". See this side-by-side comparison of different years to get a sense of the shrinkage. For example, between September 1979 and September 2007, it shrunk from 7.2 to 4.3 million square kilometers. But at the South Pole (Antarctic), sea ice has been expanding. For example, if you select the appropriate dates in this side-by-side comparison, you will see that the area covered by sea ice grew from 18.4 to 19.2 million square kilometers between September 1979 and September 2007. Note: I wrote this article to attempt to understand for myself competing claims that ice at the poles was growing or shrinking. This essay isn't trying to argue or interpret. Rather, it is just presenting facts. It also obviously provides a comparison solely of September 1979 to September 2007 ice coverage, and makes no claims as to any other years. Please analyze other years and other sources of data for yourself and draw your own conclusions. PhD economist Marc Faber said in a recent interview that the last bubble to crash will be in long-term U.S. treasury bonds. Indeed, Faber has suggested shorting long-term treasuries at just the right moment. (He also is confident that - sooner or later - the U.S will go bankrupt). The Fed is misleading investors into the biggest bubble of all time. Bernanke is making what learned economists call a "time-inconsistent" promise to hold interest rates at ultra low levels for an extended period. The problem is that if the unconventional monetary policy works, and the economy picks up, the Fed will come under pressure to "normalize" rates and reduce excess liquidity to prevent a rise in inflation. The resulting rate rises will inflict massive losses on anyone who bought bonds at today 2.25 percent rate. Bizarrely, Bernanke and Co are in fact inviting investors to bet the policy will fail, the economy will remain mired in slump for a long period, deflation will occur and interest rates will remain on the floor, as Japan's have done since the 1990s . . . . Bernanke and Co are gambling memories will prove short and investors will prove just as eager to pay top prices for long-term government and private debt even though the downside is large [as previous times when they've bought at the top of the market]. 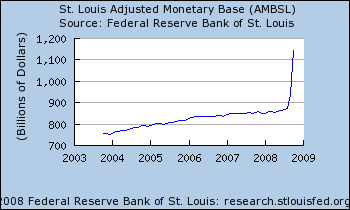 [The fed is really saying] Let us have one last bubble, and when it collapses, we promise not to do any more in future...honest. The must-create-big-bubble-to-fight-the-big-bust-we-created-with-the-last-bubble shenanigans of the Fed are leading us into disaster. Indeed, if you are worried about the economic crisis, the threat of martial law, or anything else . . . this will put things in perspective. It will also show you that sometimes things are out of your control (my wife is always telling me that I'm too arrogant in thinking I can figure everything out), and that you just have to laugh. In September, scientists said that the sun's solar wind is at a 50-year low. Since the solar wind shields Earth from harmful radiation originating outside of our solar system, this could mean that we are at increased risk of getting wiped out. Yesterday, scientists announced that "recent satellite observations have revealed the largest breach yet seen in the magnetic field that protects Earth from most of the sun's violent blasts." And today, McClatchy has a story entitled "Forget the economy: Killer asteroids could pose real danger". You've gotta' laugh at this . . . cosmic comic relief in a Monty Python kind of way. And, of course, Yellowstone might blow. Rating service Fitch is backpedaling on its previous optimistic projections of Alt-A mortgages, and is now calling for a higher percentage of defaults. Fitch forecasts a default rate of up to 15% in some cases. 15% default rate doesn't sound that bad, right? Its not just subprime loans anymore. "If we are not able to do that [jump-start economic activity], then social unrest may happen in many countries - including advanced economies," Strauss-Kahn said. He joins Senator Dodd, a leading economist, a leading trend forecaster and others who have issued similar warnings. "The cost of living in the U.S. probably fell in November by the most on record, as the value of oil plunged and retailers slashed prices to boost sales before the holidays, economists said ahead of a government report today. Consumer prices probably dropped 1.3 percent last month, the most since record-keeping began in 1947...."
Top financial advisor Agora Financial says "Filter out adjustments, and CPI dropped 1.9%, the greatest fall since 1932." Barclays reports that base metal prices have fallen at least as quickly as during the Great Depression. Even though the fed has injected trillions into the economy, banks are hoarding rather than lending, so the money isn't slowing down the destruction of credit and wealth. Deflation has already hit hard. Of course, hyperinflation is probably coming next. And see this. Charts courtesy of the Fed, GaveKal and John Mauldin, all as reprinted here. This comes only days after the Senate Armed Services Committee unanimously concluded that Rumsfeld and other top officials were responsible for the torture program, and that torture doesn't work. This is the third of 3 essays on trust and the economy (the first two are here and here). The big unanswered question, for years, was why this money flow [from China, Japan, and America's other creditors] persisted. Why the heck were foreign investors willing to lend the U.S. such large amounts of money on such good terms? Economists and journalists spun out hypothesis after hypothesis (we'll see more below), but there was no agreement on why. However, the low-risk, good-return story simply wasn't true . . . .
What comes next? The fallacy is punctured. Globalization will be seen as what it is—a game with risks that can't be wished away. Business Week is discussing investments and the economy. But isn't the same true about America's political and justice system? The world is in deflation, partly because the velocity of money (i.e. the speed at which a dollar bill changes hands from one person to the next) has slowed to a crawl, bringing on deflation and worsening the financial crisis. As perhaps the world's leading living authority on monetary policy and the Depression notes, banks won't lend to each other because they don't trust that the other guy has an accurate balance sheet, and is not about to get sucked into a black hole of derivatives liability. Surely I can't argue that lack of trust in the government has anything to do with the slow down in the velocity of money? Moreover, political leaders who lie repeatedly send the message to the rest of the country that it is okay to lie. In other words, the government's lying about Iraq, spying, torture, and 9/11 (see below) sends the message that the government won't punish liars. And by implication, that means that the banks and other financial players knew they could get away with murder. In a wink-and-a-nod era, the people who played fast and loose with our money knew they wouldn't get in trouble. Madoff, the former Nasdaq chairman, is emblematic of that wink-and-nod thinking by financial as well as political leaders. We need to show that even the political leaders will be held accountable for their war crimes and their lies and that even the financial captains will be held liable for their scams. Only then will Wall Street really get the message that they have to be honest. Only then will Americans start believing in one another again. Only then can the economy recover. Trust is indispensable in friendship, love, families and organizations, and plays a key role in economic exchange and politics. In the absence of trust among trading partners, market transactions break down. In the absence of trust in a country's institutions and leaders, political legitimacy breaks down. Much recent evidence indicates that trust contributes to economic, political and social success. After World War II, the U.S. had enormous social capital. We were looked at as the "good guys" in the war against Hitler, Mussolini and Hirohito. Many people worldwide - rightly or wrongly - wanted to copy America. When Bush was elected, I told my wife (and have argued ever since) that we were moving into a "post world war 2" period. Specifically, I knew that - with Bush as president - America would go start some wars, that America's military policy and image would both change drastically, and that the post world war 2 trends would all change. The facts - which all of the world knows - that the boys lied us into war in Iraq, tortured widely in Iraq and Afghanistan (importing communist Soviet Union torture techniques) and then said "we don't torture", spied on Americans (even before 9/11 ... confirmed here and here) and said "we don't spy", and covered up the facts about 9/11 (even the 9/11 Commission thinks there was a coverup ... see also this) have destroyed the world's trust in America. Indeed, if American leaders employed communist torture techniques, Stalinist suppression of freedoms, and launched wars based on false pretenses like Hitler, can anyone believe that our leaders are not using the treasury as their own piggy bank and manipulating the economy, just as those systems did? We can only restore trust by coming clean and holding everyone who committed these crimes - even the high and mighty - responsible. In the words of the Business Week article on Madoff, the government's "fallacies" about the need to invade Iraq to stop WMDs, the need to torture to get information for use in the war on terror, the linkage of Iraq and 9/11, and the inability of the government to stop the 9/11 attacks have now all been "punctured". Everyone now knows that they simply weren't true. The Emperor has no clothes. And the sooner that we admit it, the sooner we can address reality and start to restore trust in America. In "The New Bubble: Cash", I argued that there was a bubble in U.S. dollars and treasuries. “Treasuries have some bubble characteristics . . . . The government and the Fed cannot continue to talk about trillions of dollars of financing and expansion of the Fed’s balance sheet without the dollar going south”. Many others are saying the same thing. But how do we know when the dollar bubble will pop? In other words, when should we get out of dollars? “The dollar will go to new lows as the U.S. attacks its currency,” said John Taylor, chairman of New York-based FX Concepts Inc., which manages about $14.5 billion of currencies. Citigroup Inc., Goldman Sachs Group Inc., BNP Paribas SA and Bank of America Corp. predict further weakness. Last week was the first time in almost a month that consensus estimates for the dollar against the euro through 2009 fell, according to the median forecast of 47 strategists surveyed by Bloomberg. Robert Sinche, the head of global currency strategy at Bank of America in New York, the third-largest U.S. bank, says the dollar is bound to weaken because investors are starting to focus on traditional measures of value such as relative interest rates, budget deficits and trade balances. Like Goldman Sachs, London-based Barclays Plc, the U.K.’s third-biggest bank, forecasts the dollar will weaken to $1.45 per euro by the end of 2009, according to data compiled by Bloomberg. New York-based Morgan Stanley strategists Stephen Jen and Spyros Adreopoulos, who in August advised clients to buy the dollar, said in a Dec. 11 report that the currency may strengthen in the first half of 2009, before “underperforming most other currencies” as the global economy recovers. Those who know have repeatedly said that torture doesn't work. See this and this. "The administration’s policies concerning [torture] and the resulting controversies damaged our ability to collect accurate intelligence that could save lives, strengthened the hand of our enemies, and compromised our moral authority." Can we please stop torturing now? America in the last 7 years or so has undermined both personal trust in our leadership (Bush, Cheney and Congress are the least popular president, VP and congress in history). Moreover, Americans trust in our institutions - institutionalized trust - has also collapsed. Surveys show that Americans' trust in our government and in governmental and financial systems has plummeted after the government's failure to stop the 9/11 attacks, lying about Iraqi WMDs, letting New Orleans drown in Hurricane Katrina, spying on Americans and torture. Americans no longer trust the politicians, the justice system, their ability to obtain liberty, or the media. They sure don't trust the bankers and the financial bigwigs, who they rightfully blame for bringing on the financial crisis. Indeed, if our leaders aren't following the Constitution or the rule of law, and are lying about what they're doing, why should we believe that they are enforcing the rules of a free market? Everywhere we look, we see that those with power act as if they were above the law. It is true of banks and Wall Street giants, as well as politicians. Many people may not know it yet, but the current financial crisis will likely be worse than the Great Depression. See this and this. It will be the worst financial crisis America has ever faced. Is it any coincidence that it is coming during the same time frame in which the Constitution, the rule of law and international law on torture and warfare have been abandoned? I don't believe so. I believe that the collapse of trust from all of these events has created a crash of the most important bubble of the last 200 years: the idea of government by laws instead of arbitrary people, of representative government, and of a free market. All of these innovations occurred in the 18th century. The bubble created by the Constitution and the Bill of Rights, Adam Smith's idea of the free market - and all the prosperity which those ideas enabled - has popped. (It may just be coincidence, but it is interesting that Elliot Wave theorists are predicting that we are ending a larger cycle which started in 1718, and that we could crash all the way back to that point. 1718 is right before Adam Smith wrote about the free market and the Founding Fathers wrote the Constitution and formed America). Unless we try and convict those responsible for attacking the Constitutional form of government and the free market, we cannot restore trust. As an afterword, it should be remembered that foreign investors in America - like China, Japan, Saudi Arabia, the UAE and others - invested in the U.S. because they believed that the U.S. economy was strong and that the financial systems were both efficient and transparent. As Peter Schiff and others have warned for years, foreign investors will start pulling out of the U.S. economy when they figure out that it is built on a house of cards. China's sovereign wealth funds will cut way back on their U.S. investments. The same is true for Saudi and other investors. Now that they finally understand that America's seeming wealth was a house of cards and that they cannot trust American accounting, they no longer want to do as much business with America. Until America restores trust by speaking accurately about what is occurring, foreign investors will not want to invest large sums of capital in America. Indeed, no one wants to invest in a banana republic . . . and the U.S. has become a banana republic. Telling the truth about torture, war-lies and 9/11 is a good start (in addition - obviously - to making accounting and rating transparent). For the rest of the world knows the truth, and seeing the U.S. honestly address these festering wounds will help them regain trust in America. For those who point out that the crisis is worldwide, I would agree. Financial manipulation is not limited to America, nor is torture, or false flag terror. The points in this essay apply, to varying degrees, to the rest of the world as well. "This crisis is now fundamentally about psychology. This is now a PSYCHOLOGICAL problem." Understandably, the Fed's refusal to disclose who it gave $2 trillion in loans to, and Paulson's failure to disclose what Treasury is doing (even to the official Congressional TARP oversight committee) are adding to investor and taxpayer distrust. Obviously, they need to start disclosing what they're doing. And the big financial institutions don't trust each other, because they know that all of the other companies might have hidden their problems or gamed their books. See this, this and this. But these facts cannot be taken in a vacuum. Remember, every time Paulson, Bernanke or Bush open their mouths, the stock market dives (see this and this). Well, what if - on your way to the bank - you happen to see your normal banker mug an old lady and steal her purse? Would you then proceed to the bank as if nothing had happened, and give your money to that banker? So How Do We Restore Trust? Even though it is contrary to conventional wisdom, I would argue that we need war crimes trials against those who authorized America's torture program to restore our trust in our government and its leaders. We need real investigations and full disclosures about the WMD propaganda, spying and 9/11. Everyone knows about these things anyway, but the lies and cover-ups have eaten away at our trust in a profound way. As counterintuitive as this may sound, the festering distrust which is killing our economy will not ease until the truth about these abuses by our government are aired. Rather than dragging the markets down with pessimism, airing the truth will restore our trust in our government, our leaders and our systems, and allow us to start to rebuild our economy and our financial system. "We were wrong" are the three magic words which can start to end the cancer of distrust and begin to revive our economy. If you are an economist, psychologist, sociologist or historian with expertise in market psychology, I would appreciate your input.